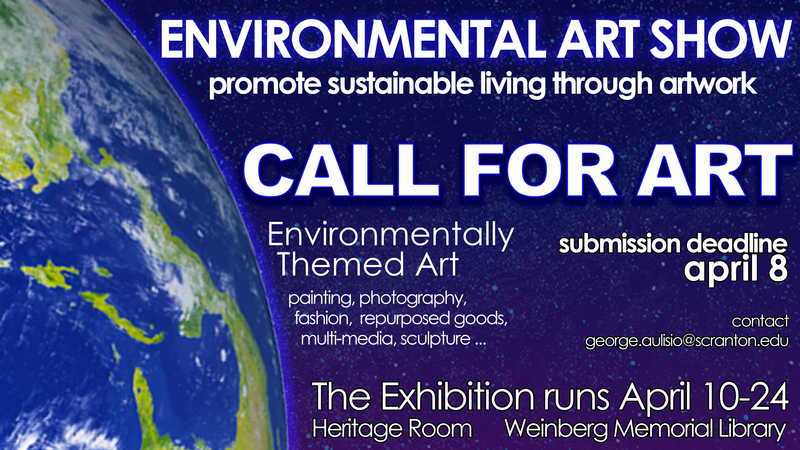 The library is seeking submissions for the 9th Annual Environmental Art Show. The art show will be held from April 10 to April 24. The Environmental Art Show promotes the natural beauty of our environment and the ideal practice of sustainable living through artworks of all types, including painting, photography, repurposed goods, sculpture, and more. The art show relies on submissions by University of Scranton student, staff, and faculty, so please consider contributing! The deadline for submissions is set for Friday, April 8. All works of art can be dropped off at either the Circulation or Research Services desks of the library. All artwork is returned after the art show ends.